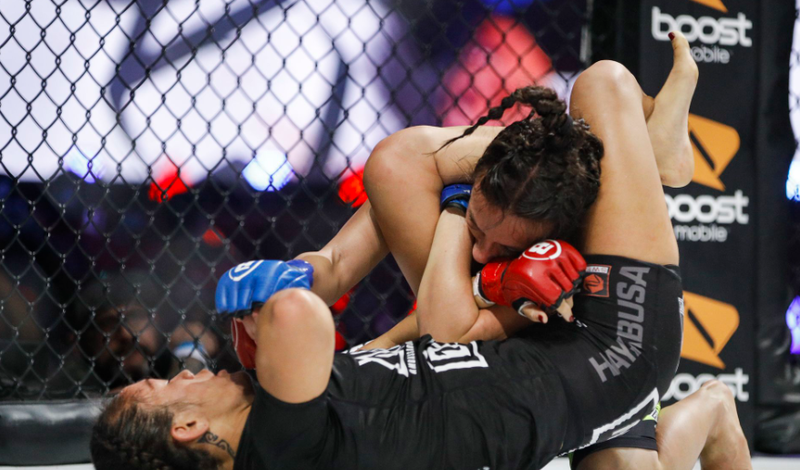 The April 27 Bellator MMA event will now feature two championship matches, as Ilima-Lei Macfarlane will defend the Bellator women’s flyweight championship that night against Veta Arteaga. This will be Macfarlane’s third defense of the title since becoming the inaugural champion at Bellator 186 in November 2017. Macfarlane retained the championship against Alejandra Lara at Bellator 201 in June before scoring a comeback submission win over Valerie Letourneau in the main event of Bellator 213 last month in front of a hometown crowd in Hawaii. Arteaga, meanwhile, will look to continue the momentum she picked up this year. Her 2018 in Bellator saw her pick up a win over Emily Ducote — who Macfarlane holds two wins over, including the inaugural flyweight title fight — before submitting Bellator Kickboxing women’s flyweight champion Denise Kielholtz. The April 27 card will be headlined by Rory MacDonald defending the Bellator welterweight title against Jon Fitch, a fight which will also serve as an opening round match in the Bellator Welterweight Grand Prix. The April 27 Bellator event takes place from the SAP Center in San Jose, California.